Silhouette images are an excellent way to bring simplicity with an artistic flare to your photographs. In his very helpful article, 7 Tips for Photographing Silhouettes, Steve Berardi shows you a handful of useful techniques that you might want to try on your next adventure. I think a big part of being successful at this is training your eye to be on the lookout for potential silhouette compositions. Subjects that might be less than thrilling in midday light can be transformed into poignant images at sunset. For example, take a look at this Grab Shot by Thomas M. Loftus. During the day, it's just another bridge shot, but at sunset the colorful sky changes the entire feel. We're always looking for ways to add drama to our photographic narrative. Silhouette compositions can help us do that. 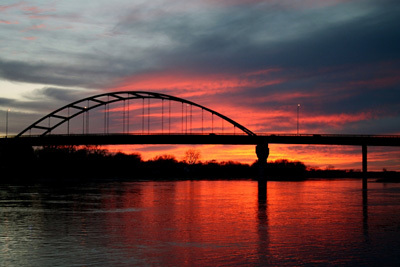 Photo of Veteran's Memorial Bridge on the Missouri River by Thomas M. Loftus.